The religion of Islam (Submission) even today continues to be one of the misunderstood religions in the world. One reason for this is the fact that for centuries this beautiful religion has been unduly presented to the world through the so-called Muslim people, scholars, organizations and countries that do not act or function in an Islamic manner, according to teachings of the Quran. It is a very easy religion to practice: one that decrees total religious freedom for all, that has full support in the Quran, that makes all the sense in the world to prepare our life for the Hereafter. [21:2] When a reminder comes to them from their Lord, that is new, they listen to it paying no attention. [42:13] He decreed for you the religion what He enjoined for Noah, and what we inspired to you (Muhammad), and what we enjoined for Abraham, Moses, and Jesus: “You shall uphold the religion, and do not divide it.” Hard for the idolaters is that to which you call them. God chooses to Himself whomever He wills and He guides to Himself whoever turns. [9:33] He is the One who sent His messenger with the guidance and the true religion that He would make it prevail over the religion of any of it, even if the idol worshipers dislike (it). [48:28] He is the One who sent His messenger with the guidance and the true religion that He would make it prevail over the religion of any of it. And God is sufficient as a witness. [61:9] He is the One who sent His messenger with the guidance and the true religion that He would make it prevail over the religion of any of it, even though the disbelievers dislike (it). [2:62] Surely, those who believed, those who were the Jews, the Christians, and the Sabians; whoever believed in God and in the Last Day, and did righteous works, will receive their recompense from their Lord. They have nothing to fear, nor will they grieve. [5:69] Surely, those who believed, those who were the Jews, the Sabians, and the Christians; whoever believed in God and in the Last Day, and did righteous works, then they have nothing to fear, nor will they grieve. [22:17] Surely, those who believed, those who were Jews, the Sabians, the Christians and the Zoroastrians, and those who were the polytheists, God is the One who will judge among them on the Day of Resurrection. God is witness over all things. 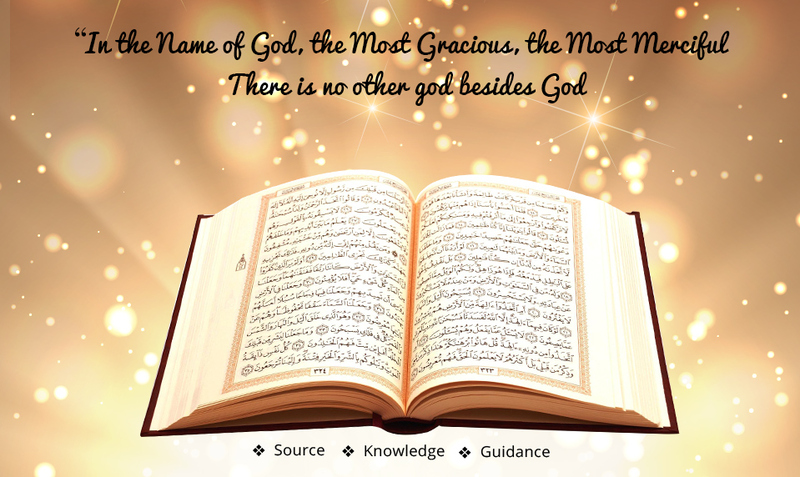 [3:19] The religion with God is Submission, and those who received the scripture did not dispute except after the knowledge came to them out of jealousy between them. And whoever rejects God’s revelations, then God is swift in reckoning. [3:83] Do they seek other than God’s religion while whatever in the heavens and the earth have submitted to Him willingly or unwillingly? And to Him they will be returned. [3:85] And whoever seeks other than Submission as a religion, will not be accepted from him, and in the Hereafter he will be with the losers. [3:3] He sent down to you (Muhammad) the scripture with the truth, confirming what was before it; and He sent down the Torah and the Injeel. [5:16] God guides with it (Quran) whoever seeks His acceptance to the ways of peace; and He brings them out of the darkness into the light by His leave; and He guides them to a straight path. [10:64] For them is good news in the worldly life and in the Hereafter. There is no change of God’s words. Such is the great success. [92:7] We will provide him with ease. [16:78] And God has brought you out of your mothers’ wombs while you knew nothing. And He has given you the hearing and the eyesight and the understanding, so that you may be thankful. [17:36] You shall not accept any information, unless you verify it for yourself. I have given you the hearing, the vision, and the understanding, and you are responsible for using them. [23:78] He is the One who has given you the hearing, the eyesight, and the understanding. Rarely are you appreciative. [3:104] And let there be a community of you who invite to what is good, advocate righteousness, and forbid from the evil, and these are the winners. [20:14] I am God; there is no other god beside Me. You shall worship Me, and observe the Contact Prayer to remember Me. [6:162] Say, “My Contact Prayers (Salat), my worship practices, my life and my death, are all devoted absolutely to God alone, the Lord of the universe. [27:19] My Lord, direct me to appreciate the blessings You have bestowed upon me and my parents, and to do the righteous works that please You. And admit me by Your mercy with Your righteous servants. [2:37] Then Adam received words from his Lord, and He redeemed him. He is the Redeemer, the Merciful. [4:125] And who is better in the religion than one who submits himself to God and leads a righteous life and follows the religion of Abraham, a monotheist? God has chosen Abraham as a friend. ​[16:123] Then we inspired to you (Muhammad) that you shall follow the religion of Abraham, the monotheist; he was not an idol worshiper. [22:78] And you shall strive in the cause of God as you should strive for His cause. He has chosen you and has placed no hardship on you in the religion – the religion of your father Abraham. He named you submitters from before and in this that the messenger may be a witness among you, and you may be witnesses among the people. So, you shall observe the Contact Prayer (Salat) and give the obligatory charity (Zakat), and hold fast to God; He is your Protector, the best Protector and the best Supporter. [33:40] Muhammad is not father of anyone of your men, but a messenger of God and seal of the prophets. And God has done being knower of everything. [33:7] And we took from the prophets their covenant, and from you (Muhammad), and from Noah, Abraham, Moses, and Jesus the son of Mary. And we took from them a solemn covenant. [15:9] Indeed, we have revealed the reminder, and indeed, we will preserve it. [27:82] And when the punishment is almost due upon them, we will produce for them a creature from the earth speaking to them that the people are not certain about our revelations. [74:31] And we made the angels to be guardians of Hell, and we did not make their number except: (1) to warn the disbelievers, (2) to make certain for those who were given the scripture (Jews and Christians), (3) to strengthen the faith of those who believe (Muslims), and (4) to eliminate any doubt from those who were given the scripture (Jews and Christians) and the believers (Muslims). And that those who have disease in their hearts (hypocrites) as well as the disbelievers would say, “What did God mean by this allegory?” Thus, God misguides whomever he wills and He guides whomever He wills. None knows your Lord’s soldiers except He. And it is but a reminder for the humans. [74:32-34] Nay, (I swear) By the moon. And the night when it departs. And the morning when it brightens. [74:35] Indeed, it is undoubtedly one of the great (signs). [74:36-37] A warning to the human race. For whoever among you wishes to advance or regress. [4:164] And messengers we have mentioned to you from before, and messengers we have not mentioned to you; and God spoke to Moses directly. [42:13] He decreed for you the religion what He decreed for Noah, and what we inspired to you (Muhammad), and what we decreed for Abraham, Moses, and Jesus: “You shall uphold the religion, and do not divide it.” Hard for the idolaters is that to which you call them. God chooses to Himself whomever He wills and He guides to Himself whoever turns (towards Him). Now we live in an age of reason and not of blind faith. It is thus necessary for any intelligent person to debate all matters and not to succumb to the influence of their native environment alone. One should not just rely on the religious background passed on through parents or the society alone. There is no doubt that our knowledge is limited but still we have the opportunity to explore God’s religion to understand it better with the help of the opportunity given by God. Thus, we may advance believing and accepting the truth upon verification or we may stay behind due to our doubt and disbelief. Let us have a sincere drive to make our journey simple and easy by understanding God’s religion as dictated by Him in the Quran and follow what makes sense to us befitting to the generation we are living now.